HUNTERSVILLE, North Carolina (March 20, 2019) – In most professional sports, each event pits two teams against each other to find out who will come out on top. Some matchups turn out to be more or less even than others but, in theory, each team has a 50 percent chance of winning that day. Where does win 200 come as far as your most memorable wins in your career? What original goals did you have when you entered NASCAR? What do you feel is the biggest key to performing well in the longer races like this weekend at Martinsville? Where have you put the Martinsville Speedway grandfather clocks you’ve won? The STP 500 will mark Kyle Busch’s 504th career Monster Energy NASCAR Cup Series start and his 28th NASCAR Cup Series start at Martinsville (Va.) Speedway. Busch has career totals of 53 wins, 31 poles, 187 top-five finishes, 274 top-10s and 16,211 laps led in 503 career Cup Series races. His most recent Cup Series win came last weekend at Auto Club Speedway in Fontana, California, his second consecutive Cup Series victory. Busch’s most recent pole, the 30th of his career, came in October at Martinsville. Busch has two wins, 15 top-five finishes and 16 top-10s and has led a total of 1,424 laps in 27 career Cup Series starts at Martinsville. Busch’s average Martinsville finish is 12.3. 53 Career Cup Series Wins: With his Cup Series win at Fontana last weekend, the 53rd points-paying win of his career, Busch sits in 11th all-time in Cup Series wins and is one win away from tying NASCAR Hall of Famer Lee Petty’s 54 wins in NASCAR’s top series. With his 40th Cup Series victory at Bristol (Tenn.) Motor Speedway in August 2017, Busch became the fourth-youngest driver to reach 40 Cup Series wins at 32 years, 109 days, behind only Richard Petty, Jeff Gordon and Herb Thomas. 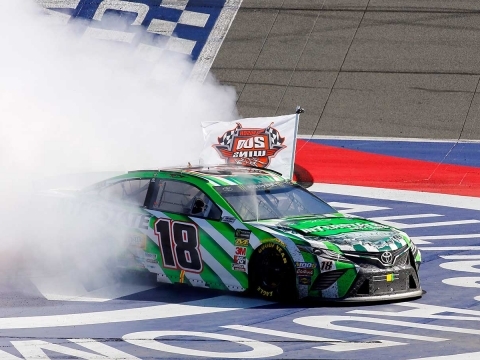 15 and 5 Club: Busch’s wins at Phoenix and Fontana the last two races means he has won at least one Cup Series race for 15 consecutive seasons. 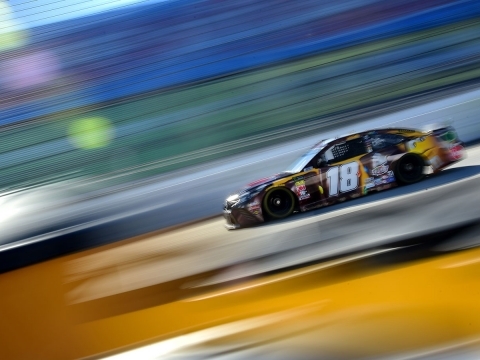 The wins also mean Busch has won back-to-back races for the fifth consecutive season. All 23: With his win at Charlotte (N.C.) Motor Speedway last May, Busch has now won a Cup Series race at all 23 tracks at which the series competes, becoming the first driver in the modern era to win at every track where he has made at least one start. Of the 23 different tracks where Busch has won, he has multiple wins at 13 of them. All-Time JGR Wins Leader: With his Brickyard 400 win in July 2016, Busch passed Tony Stewart for most all-time Cup Series wins for JGR. Busch now has 49 wins for JGR to Stewart’s 33 following his most recent win at Phoenix, along with besting Stewart’s Cup Series career win total. 200: Busch enters the weekend at Martinsville having reached 200 career wins among NASCAR’s top three divisions – Cup (53), Xfinity (94) and Truck (53) – following his Cup win last Sunday at Auto Club. 1,000: Busch enters the weekend at Martinsville having started 998 races among NASCAR’s top three divisions – Cup (503 starts), Xfinity (348 starts) and Truck (147 starts). He is entered in both the Cup Series and Truck Series races at Martinsville this weekend. Sunday’s STP 500 will mark Busch’s 1,000th overall start among NASCAR’s top three national series.